Footy Tipping was a great addition to campus life in 2015. If you're new to AFL tipping, here's all you need to know. AFL is important to many Australians, and Footy tipping is importantly tied into the lifestyle of AFL fans. For the second year running, Monash will continue its only University-wide tipping competition, which will allow students and staff to tip against each other. Before the start of each round, you must tip which team will win their upcoming match. You receive one point if you correctly tip the winner, and no points if you tip wrongly. This is all carried out via the Monash AFL Tipping website. AFL tipping is as fun as it is competitive, and lots of fun can be had by arranging your own private league with Uni friends or colleagues. This competition is exclusively for Monash staff and students, so leagues for college groups, faculty groups, staff groups and friendship groups are encouraged. A 50 inch TV, Monash Sport membership and weekly dinner vouchers are only some of the prizes up for grabs in the 2016 competition, with more to be announced closer to the start of the AFL season. 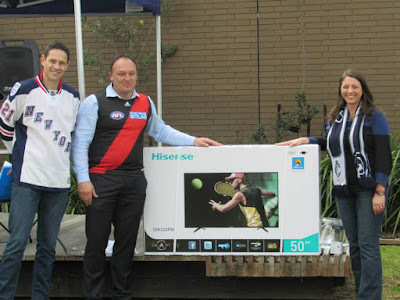 Prizes can be won by anyone who enters the tipping competition. Even if you enter in a private league, you are still automatically entered in the overall competition, in which the tippers with the highest number of points at the end of the season will be awarded awesome prizes. There is not cost to enter, it is all FREE!